Angelbird specifically cites compatibility with Plextor and Samsung SSDs (both AHCI and NVMe), although there's nothing to indicate that any x2 or x4 PCIe M.2 SSD with the "M" or "B" connectors wouldn't work (with the latter limited to x2 speeds). 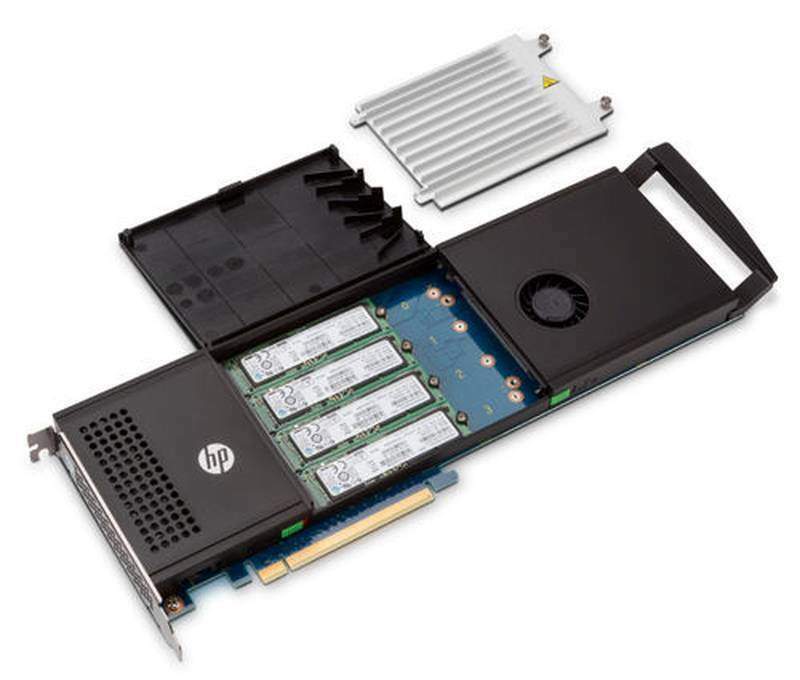 The only clear limitation is the absence of support for SATA-based M.2 drives, like the Samsung 850 EVO, as the PX1 lacks SATA passthrough support found in some other M.2 adapters. Installing an M.2 SSD in the PX1 is simple, which is good because Angelbird doesn't include a setup guide or manual in the box, requiring users to scan a QR code or visit the company's website to obtain a PDF. Users need only to insert the mounting screws into the marked hole corresponding to their SSD's length (almost all of the consumer M.2 SSDs currently use the 2280 form factor), optionally affix the second thermal pad (one thermal pad is pre-attached to the heatsink and the second included pad can be placed on the PCB if the SSD lacks chips on its underside), and then screw everything together. Once assembled, simply install the PX1 in a x4 or larger PCIe slot and make sure that your BIOS/EFI is configured properly to recognize and provide the correct bandwidth to the newly-occupied PCIe slot. While the PX1 looks and feels solid out of your case, it also pops when installed, thanks to a line of white LEDs around its edge that light up when the PC is powered on. There's no way to control the LEDs in software or via a user-accessible switch, but they're not terribly gaudy and should fit relatively well in the case designs of many users. Still, the lack of user control over the lighting is an early mark against the PX1. Out tests aim to compare the potential advantage of the PX1 against not only standard motherboard placement of an M.2 SSD, but far less expensive "standard" PCIe M.2 adapters as well. A number of PCIe M.2 adapters can be found online for around $20, but several motherboard manufacturers also include adapters in the box, either to add M.2 support to layouts that lack them, or enable the use of multiple M.2 devices on motherboards that feature only a single M.2 port. In our case, we're using the X4 M.2 adapter included with our ASUS motherboard. We performed the tests in three configurations: (1) with the Samsung 950 Pro installed in motherboard's single on-board M.2 port, (2) with the 950 Pro installed in a x16 PCIe slot via the standard ASUS adapter, and (3) with the 950 Pro installed in a x16 PCIe slot via the Angelbird Wings PX1 adapter. 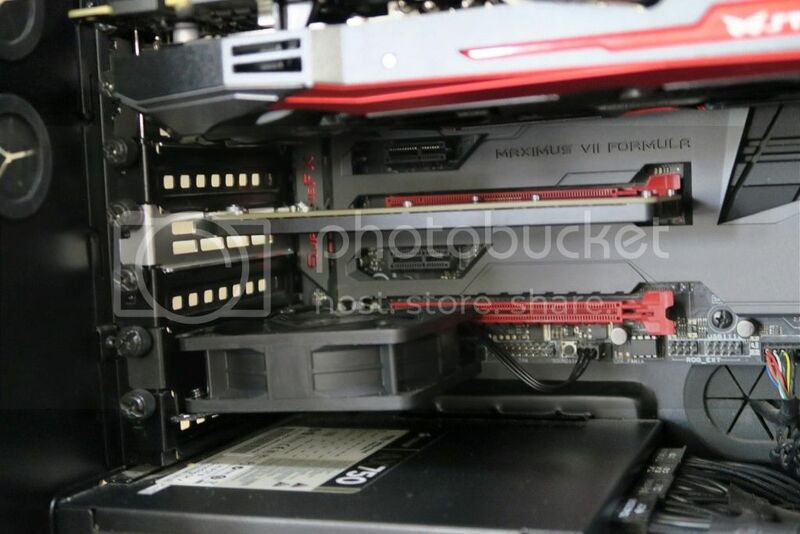 For the tests involving the PCI adapters, the cards were positioned beneath the GPU and without any special modification of the case to increase airflow to that location. Other sites which have covered the PX1 ran their tests in the absence of additional PCIe devices, and with the PX1 installed to ensure maximum airflow. We feel that this does not represent the configuration that is likely to be used by PC hardware enthusiasts interested in this product, hence our placement of the PCIe adapters beneath a high-powered GPU. Performance testing was conducted with ATTO Disk Benchmark and Iometer, while stress testing to determine maximum temperature was provided by AIDA64 Extreme, which was configured to stress all system components including the 950 Pro. Temperature values were measured via a 2-pin thermal sensor affixed to the 950 Pro's controller and monitored with the ASUS AI Suite 3 software in Windows. The results of specific tests are explained beneath their graphs in the following section. The primary purpose of the Angelbird Wings PX1 is to reduce the operating temperature of an installed M.2 SSD, so we first set out to measure thermal differences between the three installation configurations. In the chart below, Idle values were determined by measuring the 950 Pro's temperature after 20 minutes of remaining idle at the Windows desktop. This provides a baseline temperature for the 950 Pro while the PC is powered and awake but not engaged in anything other than standard background Windows tasks. On the other side of the equation, Max temperatures were measured after 20 minutes of stress testing all system components with AIDA64, providing a challenging situation in terms of both the heat produced by the 950 Pro itself as well as the ambient temperature of the case. We can see immediately that the PX1 has a significant effect on the 950 Pro's thermals. The adapter's heatsink keeps idle temperatures 7 degrees lower and maximum temperatures a noteworthy 30 degrees below the standard motherboard placement. 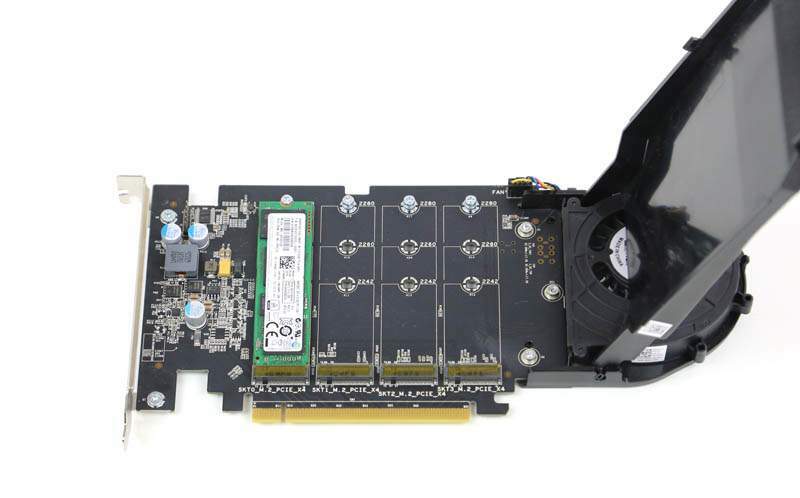 The use of a less expensive PCIe M.2 adapter proves its worth as well, however, with an 11 degree reduction in max temperature compared to the motherboard configuration. It's important to note that the temperatures measured by our tests are heavily influenced by our specific hardware. The ASUS PCIe adapter features a design which elevates the SSD quite far above the PCB for good airflow, while the M.2 port on our ASUS X99-PRO motherboard places the SSD significantly closer to the PCB, which restricts air movement around the drive. The location of the port on the motherboard itself also isn't necessarily ideal for optimal airflow in the NZXT S340's standard configuration, with the motherboard's SATA ports and the case's wire management column blocking direct airflow from the H110i's intake fans. Therefore, while our initial results clearly show that the PX1 has no problem dissipating heat, your results will vary based on the unique combinations of your motherboard layout, PCIe adapter design, and case airflow characteristics. It's clear that the PX1 performs as advertised when it comes to lowering the temperature of your M.2 SSD, but the real question is how much, if at all, these lower temperatures affect the drive's performance. To answer that question, we'll first look at some sequential numbers provided by ATTO Disk Benchmark. For the majority of transfer sizes, there is virtually no difference in performance between any of the three configurations, with the exception of the PX1 pulling just a hair ahead of the pack in read speeds. However, at the higher end of the test, we see a consistent drop in performance from the motherboard configuration only, suggesting a throttling issue due to the higher temperatures revealed earlier. Although the standard ASUS PCIe adapter was also quite hotter than the PX1 in our temperature tests, it's notable that it had no problem keeping up with the PX1 throughout the transfer sizes in the ATTO benchmark. Turning next to Iometer, we'll first look at random performance. For this test, we let the 4KB random read and write tests run for 20 minutes at a queue depth of 4 and reported average performance in megabytes per second over that period. While we see virtually no difference in random read performance between the three configurations, the PX1 pulls ahead in random writes, besting the motherboard and ASUS PCIe adapter configurations by 18 and 3 percent, respectively. The 256KB sequential test is where performance limitations due to temperatures really come into play, although it appears that simply moving the 950 Pro off of the motherboard and into a position of better airflow, regardless of additional heatsinks, is the key. While the 950 Pro installed in the PX1 is about 87 percent faster in both sequential reads and writes than it is when installed on the motherboard, there is an insignificant difference in performance between the PX1 and the open-air ASUS PCIe adapter. For a passively cooled design, we were surprised to see how far the Angelbird Wings PX1 lowered the Samsung 950 Pro's operating temperatures compared to the alternative configurations. However, while the reduced temperatures may have some unknown long-term effect on the 950 Pro's longevity and reliability the reality is that virtually all of the real-world performance benefits that the PX1 offers compared to the 950 Pro's installation on the motherboard can be obtained from a much cheaper "standard" PCIe M.2 adapter like the one in our test. In fact, your motherboard box may contain an unused adapter at this very moment. Keep in mind, however, that our ASUS PCIe adapter may have performed as well as it did thanks in no small part to the way that it holds the SSD well above the PCB. Many other PCIe M.2 adapters, including the PX1 without its heatsink, provide far less airflow underneath the SSD, so be sure to confirm an adapter's design before purchasing in order to ensure the best thermal results. In the end, the main takeaway is that temperature, and by extension thermal throttling, may still be a factor you need to consider with M.2 SSDs. Just how much high temperatures affect you, however, will depend on the airflow design of your case, the location of the M.2 ports on your motherboard, and your willingness to reconfigure your case layout to address the issue. Adding a $75 Angelbird Wings PX1 to your setup is certainly one way to go, but you could also easily save some money with the use of a standard PCIe adapter that is designed to allow good airflow around the SSD. At worst, you could simply rig up a case fan to blow directly across your motherboard's M.2 ports. In summary, the PX1 looks good, features great build quality, and performs as advertised. But the real lesson from these tests is to save the $75 and try a $20 PCIe adapter first. If you still need to go further after that, you can find the Angelbird Wings PX1, complete with its 10-year warranty, available now from RamCity via Amazon. I bought a bunch of heatsinks to put on the drive. I have it connected to the motherboard (MSI Z170A GAMING M7). I honestly don't know if it helped but I have a 40MM fan that I need to install. Below are what I picked up from Newegg to use. Is it the nicest looking solution, no. But I have the room and it can't hurt. I don't like the idea of my 950 Pro 512MB throttling because of temperatures. Did you remove the sticker from the 950? Nope, I just stuck them over the sticker. The hope is if something happens I can gently remove the adhesive from the heatsinks. I put as many as I could on the controller and the rest went on memory chips. Picture of the ATTO run. To really cool off my Samsung 950 located under my Asus Z170I Pro Gaming mobo I used a 12v DC Brushless blower fan for $2 works well for me. My 950 Pro 256 temperature measured by Crystal Disk Info went from 49°C to 31°C. Running the fan at 7V to quietened it, and the temperature is a reasonable 34°C. PCB assembly, PCB layout and PCB layout design are among the most sought out after engineering works and this market is composed of several billion dollars of revenue on a yearly basis. These boards are used in almost all of the electronic devices that can be found under the sun. From the smallest such as toys to the largest such as machinery to the extremely complex such as space shuttles and submarines, printed circuit boards are found in some capacity. you guys should also review Aquacomputer's SSD adaptor/cooler for m.2 ssds. I have had one on my 950 for months now never been over 40C I do have a 80mm fan blowing up on it...works great. Review doesn't have a photo showing what it looks like with the heatsink installed. Lame. What about heat? We ran our storage stress test (constant recycling Blackmagic Disk Speed Test for several minutes). The sensors of the four SM951 AHCIs reported high temperatures of 158F, 160F, 158F, and 165F. Those are right at or just above the recommended maximum of 158F by Samsung. But those temperatures are significantly lower than the 174F reported when the SM951 AHCI was mounted on other M.2 PCIe boards without heatsinks. One reason the Amfeltech Squid board runs cooler is likely due to the method of mounting the SM951 AHCIs that leaves an air gap above and below, allowing the PCIe bay inlet fan to do a better job of keeping the SM951 AHCIs cool. out the rear chassis panel. Well there is liquid cooled ramsinks couldn't EK build a m.2 adapter that's prefilled make custom blocks for them. Doubt could liquid cool em in m.2 slot on motherboard.